Digital marketing campaigns are not a new currency. But until recently, they were used to prop up offline marketing activities, never seen as a stand alone strategy. In 2014, we saw an increasing number of brands going for pure digital marketing campaigns and with the number of people spending time online, it is no surprise that they worked very well. The Concept: Banking on the rise of the second screen experience, Heineken designed a 90 minute real time show during the Champions League by the name #ShareTheSofa. This show allowed avid football watchers to share their football watching experience with legends of the game like Ruud Van Nistelrooy, Hernan Crespo and Fernando Morientes, without distracting them from the game. What worked: With most football watchers clutching on to their tablets during the game, this was a perfect engagement idea. Add to that the lure of sharing a (virtual) sofa with football greats and being able to chat with them in real time and this was a sure fire winner. The show also had a lot of fun elements that didn’t let brand Heineken dilute in any frame. The celebrities and interesting characters ensured that both traditional news media and social media regulars talked about it, generating more content and eyeballs along the way. What worked: This campaign was for a good and very identifiable cause, with everyone knowing at least one cancer victim or survivor. The simple heartfelt tribute video was seen by more than a million people, which promoted the cause. The Call to Action was also a very simple one, with users only having to visit a site and ‘Purpling their profile’ with a click. With most people wanting others to see and ‘like’ their profile pictures, the share option also went a long way in spreading the word. Over 1 million people did what Chevrolet asked them to do and Chevrolet delivered on their promise of donating $1 million for the cause. What worked: The combination of a fun challenge, good cause and entertaining video potential made this challenge the biggest social media trend of 2014. Hollywood celebrities like Robert Downey Jr., Justin Timberlake, Jennifer Garner (the actual list is too long) accepted this challenge on camera and these videos generated a huge amount of curiosity and a ‘me-too’ conformity. Most people who were tagged on camera didn’t wish to shy away from the challenge which lead them to paying up for the cause.The numbers that this challenge generated are staggering, with more than 2.4 million tagged videos making their way to the Internet. The ALS Association generated more than $100 million in donations, and the celebrities who participated in the challenge also got a bunch of (nearly) free publicity. What worked: Topshop’s strategy worked well for its tech savvy young target audience as it gave them a sneak peek into the otherwise off limits fashion show. It also appealed to the ‘selfie’ generation by giving them a chance to feature in the Topshop window. The campaign tapped into the want of exclusivity among fashionistas and enabled them to get their manicured talons on the latest collection before others bought them in the store. This made Topshop’s fashion show not just a catwalk event but a full blown online fashion experience. What worked: Sports fans are usually hooked on to social media during games, posting updates about every score and miss. This real time activity gave fans a chance to show their support for their favourite teams and players with many options of headlines, stickers and filters. It also didn’t require an app, with users being able to customize the ads through their mobile browser. The best part was that the shot of the player was available within 10 seconds of the action on field, which gave a sense of real time participation to users. Couple that with its shareability on social media and you have a great way to proclaim your love for football, as most fans love to do. 2014 was also a notable year for BlogAdda as we tried and might we say, succeeded in pulling off a host of different campaigns. As is customary at the end of every year, we’ll indulge in some year end nostalgia and bring to you the best campaigns at BlogAdda, in no particular order. Concept: Gillette in association with BlogAdda launched the ‘My Role Model’ activity where bloggers were invited to talk about the men in their life who had influenced them. Bloggers could write, post photos and make video blogs for their role models, explaining how the men impacted their lives. This two month campaign was judged by Kiran Manral and Laxmi Hariharan, with Youtube sensation Kanan Gill judging the video blogs. What worked for bloggers: The campaign succeeded in touching a chord with people and helped them use their blogs to thank the people who have moulded them. The freedom to express themselves through text, photos and videos inspired the bloggers to be creative. Rahul Dravid was the face of the campaign, who is a role model for many himself. The fact that the contest was judged by two illustrious bloggers gave that extra push required for enthusiastic participation. This campaign offered some very attractive prizes like a Sony Bravia LED TV. It also coincided with Father’s Day and the bloggers were only too happy to write about the father figures in their life. The topic also lent itself well to social media conversations, with bloggers talking about it on Facebook and Twitter. Concept: A hand picked bunch of bloggers were invited to partake in the enviable off roading experience with the new Land Rover Freelander 2 and the Range Rover Evoque. The bloggers were taken to a scenic location and encouraged to try out the unique features of the SUV on terrains ranging from a steep cliff to a lake. What worked for bloggers: Getting to try your hands at off-roading in a Land Rover or Range Rover is a dream come true for any adrenaline junkie. The features of the cars were explained to the bloggers, which helped them try out the car for themselves. Driving through 4 feet of water or descending a steep slope easily makes for superb content for a blog. Add to that the thrill of clicking the cars in all their glory and capturing the drive on video is a very tempting proposition. 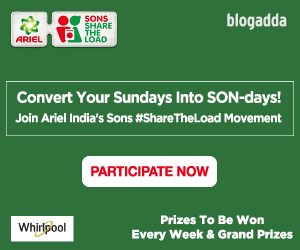 The share-worthiness of this activity was very high as the bloggers included their friends in the drive by sharing photos and updates before, during and after the activity, earning many envious replies! Concept: In the Quikr activity, bloggers were invited to browse through the Quikr website and were given Rs. 5000 to shop on the website and blog about the experience. The best blog posts would win more Quikr vouchers with which to shop! What worked for bloggers: The activity was well timed as it coincided with the festive season when online shopping is anyway at an all time high. The simple premise of shopping worth Rs. 5000 worked well, as bloggers used their creativity to shop for items of their choice. Fitting their items of choice in the budget, interacting with sellers personally, and receiving the items made for great blog posts. Posting photos of the received items took care of the social media angle, providing for good conversations. Post by Make a change. Concept: #BlogToFeedAChild was part of BlogAdda’s ‘Blogger Social Responsibility‘ in association with Akshaya Patra. Bloggers were asked to blog about ‘Ways to eliminate classroom hunger’ and for every blog post, BlogAdda would feed one child for an entire year. 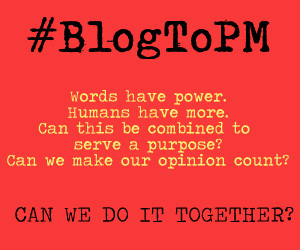 What worked for bloggers: The uniqueness of the campaign appealed to bloggers as it was one of the few social responsibility campaigns undertaken by a blogging community. The premise and theme were simple, enabling bloggers to come up with interesting solutions to end classroom hunger in India. It appealed to the altruistic side of people and the fact that they had to use the power of their blog to feed a child for year drove them to action. Bloggers who participated in the activity were given personalized badges thanking them for their involvement, which spurred more bloggers to write for a good cause. Concept: Aimed at promoting the innovative black toothbrush from Colgate, #WhatTheBlack campaign was carried out in two phases. Phase 1 called bloggers to write about their ‘black’ wishlist, i.e., 5 black items that they wished to possess. Phase 2 saw a select group of bloggers get 4 black items that were usually not black in colour like black eggs and black newspapers. On the final day, they received the black Colgate toothbrush, putting an end to the mystery of four days. What worked for bloggers: Phase 1 saw people give in to their darkest desires and come up with a black wishlist, letting their imagination run wild. Phase 2 was one of the most innovative online activities this year as it was high on the mystery and awe meter. The 4 unusual black items generated a lot of curiosity among bloggers which then made its way to social media in the form of images of the items with #WhatTheBlack. This set a great tone for promotion of the activity. The campaign was a perfect combination of relevance to the subject and an engaging activity for bloggers. Concept: The Zest Blogger Outreach Program was a part of Tata Motors’ rebranding as a lifestyle and sports auto maker and aimed at providing buzz for the launch of the new ZEST. This again was a campaign that took place in two phases- Phase 1 played on the word ‘Zest’ and invited entries about things that added zest to people’s lives. The second phase was on a mammoth scale where 50 bloggers were taken on a drive to Goa for a fun outing. What worked for bloggers: The inclusion of the word ZEST in Phase 1 helped people connect the brand to fun and excitement in their lives. Phase 2 had a huge impact on the online space, with quality content generated by 50 bloggers in the form of blog posts, social media updates and live blogging of the drive and event. This resulted in creating an unprecedented buzz that ensured that Tata ZEST launched with a bang. 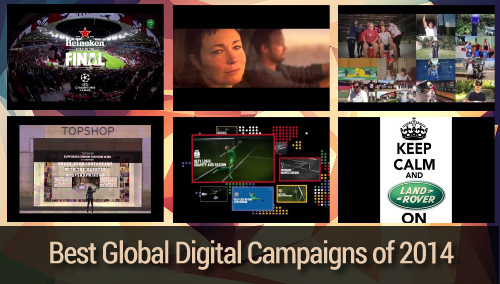 These are BlogAdda’s choices for the best digital marketing campaigns of 2014. Do you have any marketing campaigns that caught your eye in the last year? Tell us in the comments section! Apart from these campaigns, 2014 also saw the KidsHut by T-Series, #WillYouShave, MakeMyHome, Tourism Malaysia, SkyScanner, I Am Mardaani and INK campaigns on BlogAdda. 2015 has also started off on a great note for BlogAdda and bloggers with the Get. Set. Bolt campaign! Brilliant post Team BA. Bringing to us the various campaigns worldwide, and Kudos to you too for bringing out so many campaigns from your own stable, so effortlessly. Loved the concept behind #WhatTheBlack and Quikr. P.S. : Thanks for including my FB post in #WhatTheBlack’s round-up. It was a pleasant surprise.